Keemun black tea is produced in Keemun county, Anhui province.The production of black tea in Keemun started from 1875. Keemun black tea win the praise of "one of the best three high aroma teas in the world " and "the queen Of fragrance "
The appearance of Keemun black tea is slender and elegant.The reddish brown tea liquor is tasted heavy and brisk. 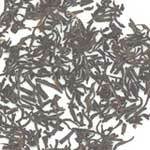 The lasting strong aroma resembling both aroma of fruit and that of rose is the distinctive flavor for Keemun black tea, that is hence named "keemun flavor".